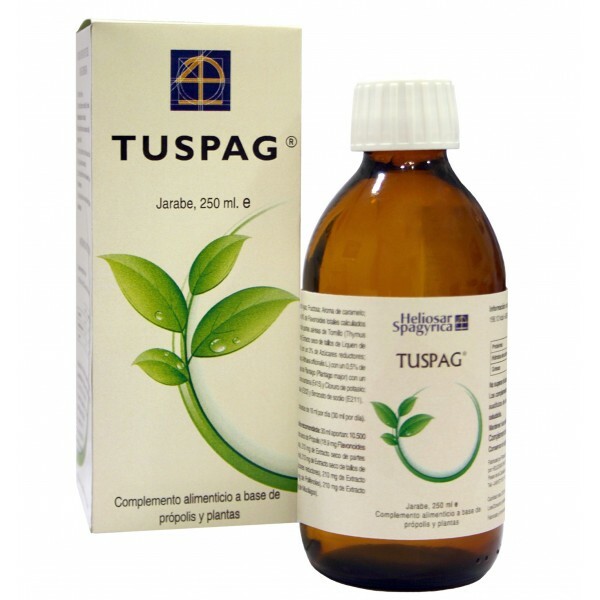 Heliosar Spagyrica Tuspag Syrup propolis and plants 150 ml. Syrup based on TRADITIONAL PLANTS, PROPOLIS, COPPER and VITAMIN B3. Water, fructose, fluid extract of Thyme (Thymus zygis L.), fluid extract of Lichen from Iceland (Cetraria islandica Ach. ), Fluid extract of Marshmallow (Althaea officinalis L.), fluid extract of Plantago (Plantago major L.), fluid extract of wild pine (Pinus sylvestris L.), fluid extract of propolis, nicotinamide (Vitamin B3), copper sulphate, potassium chloride (Kalium muriaticum). 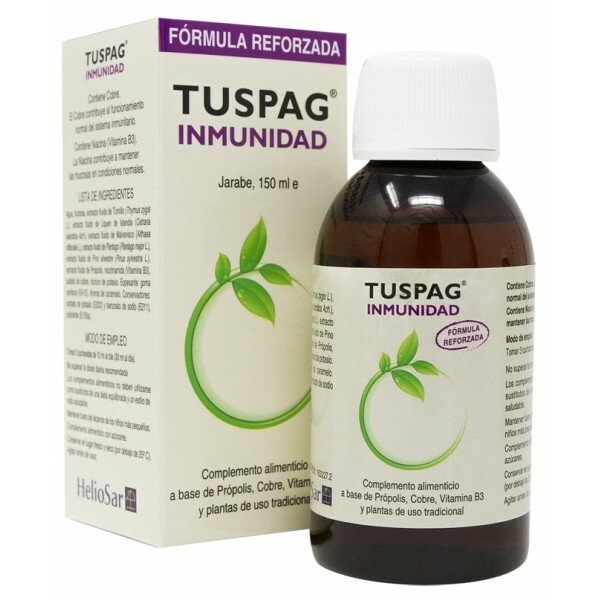 Ingredients: Water, fructose, fluid extract of Thyme (Thymus zygis L.), fluid extract of Lichen from Iceland (Cetraria islandica Ach. ), Fluid extract of Marshmallow (Althaea officinalis L.), fluid extract of Plantago (Plantago major L. ), fluid extract of wild pine (Pinus sylvestris L.), fluid extract of propolis, nicotinamide (Vitamin B3), copper sulfate, potassium chloride (Kalium muriaticum). Propolis Immunostimulant, anti-inflammatory and emollient (softener). Thyme [Thymus zygis L.] Immunostimulant, expectorant, anti-inflammatory, mucolytic and antiseptic. Plantago [Plantago major L.] Emollient, antibacterial, expectorant, decongestant of the respiratory tract, antiallergic and anti-inflammatory. Marshmallow [Althaea officinalis L.] Soothes irritation of the respiratory mucosa, expectorant, softener, emollient (softener) and demulcent (protective). Lichen from Iceland [Cetraria islandica Ach.] Antitussive, mucolytic and demulcent (protective). Copper Contributes to the normal functioning of the immune system. Potassium chloride [Kalium muriaticum] Action by ENT mucosa. Excess mucus. Cough of different etiology (origin). Scots pine [Pinus sylvestris L.] Antiseptic, antimicrobial, vasoprotective, purifying and antioxidant properties. Vitamin B3 Contributes to the maintenance of mucous membranes under normal conditions. Sweetened naturally With fructose extracted from vegetables. 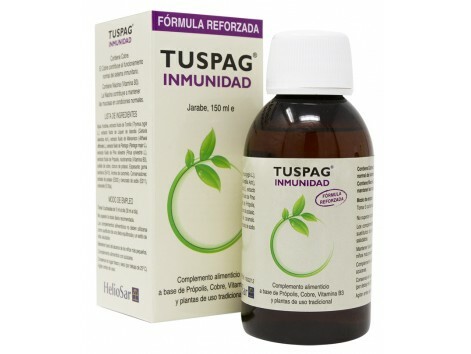 1 tablespoon of 10 ml, 3 times a day (30 ml a day).